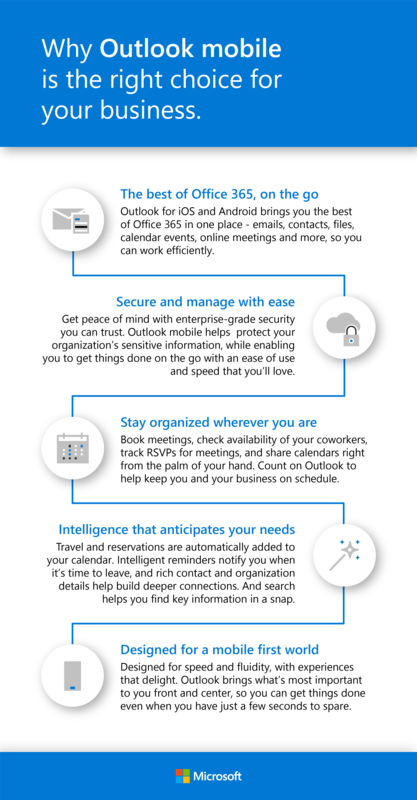 Three years ago, we launched Outlook mobile with a mission to deliver the best on-the-go email and calendar app, one that combines delightful customer experiences with enterprise-grade security. To serve an ever more mobile and distributed workforce, today we are announcing new, advanced enterprise capabilities for Outlook mobile with support for Microsoft Information Protection native labeling, as well as improved mobile device management. We’re also helping our customers stay connected and on top of what’s important with new features including Favorite Notifications and Microsoft Teams integration in Outlook. We’re confident that these new capabilities, along with our continued commitment to a first-class user experience, will help make Outlook mobile the preferred choice for your organization. 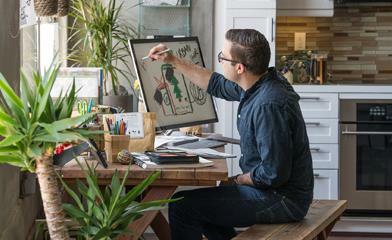 Designed uniquely for a mobile-first experience, Outlook for iOS and Android introduced new ways to stay connected and organized all in one app while helping you focus on what’s truly important. Over the years, we’ve delivered deeper integration with Office 365 and added an array of artificial intelligence (AI) capabilities that help anticipate your needs. We also re-architected Outlook mobile on the Microsoft Cloud and added a broad range of enterprise and compliance capabilities, such as FedRAMP, Hybrid Modern Authentication, and support for app protection policies to help you protect and manage your organization’s confidential information. We’re delighted to receive continued high ratings for Outlook mobile from customers like you. As we further our vision with today’s announcements, we hope to keep earning your trust in Outlook mobile as the right choice for your business. We know that protecting confidential information is top of mind for our customers, so today we’re announcing new capabilities to help you secure sensitive information while making it easier to manage and deploy Outlook mobile. We’re committed to delivering best-in-class enterprise and security capabilities along with the ease of use and speed you love. Customers will soon be able to classify and label Outlook mobile emails to help ensure that sensitive information is handled in compliance with your company policies. We are introducing Microsoft Information Protection native labeling in Outlook for iOS and Android to help enforce a common set of protection policies and actions across Microsoft 365 apps. For example, administrators could specify custom sensitivity labels such as “General” or “Company Confidential” with corresponding actions such as adding a footer to emails or encrypting emails, respectively. As a user, you will then be able to add a “Company Confidential” label to the email so that it can only be opened by recipients who are authorized to decrypt the message. Your administrator could also set up a policy to allow you to change a sensitivity email label if necessary but require a justification to do so for tracking and compliance purposes. Our goal is start rolling out this feature to commercial Outlook mobile customers by the end of the year, initially in preview. To enable organizations to get their employees quickly set up on their secure mobile email and calendar solution, we’re adding new app configuration capabilities for Outlook mobile. 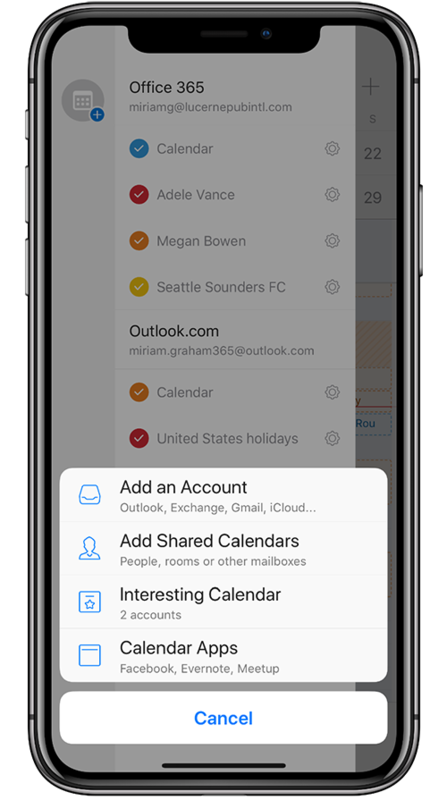 Ensure only corporate accounts are added to Outlook mobile for managed devices—We recently rolled out a new experience to help ensure that adding only work accounts is straightforward and to help mitigate the risk of employees using personal accounts on company devices. For example, administrators can specify the corporate email and OneDrive for Business accounts that are allowed in Outlook mobile. Administrators will be able to specify that only work accounts are added on company enrolled devices. Additionally, we will be rolling out the capabilities listed below in the coming months to commercial Outlook mobile customers. Scale deployments and enforce consistency—Administrators will soon be able to push specific Outlook mobile app configuration settings such as the on/off state for syncing or saving contacts, biometrics such as Touch ID, block external images, and MailTips, as well mail options such as Focused Inbox settings to their users. Standardizing these settings will simplify and scale the deployment of Outlook mobile while helping ensure that users have a consistent experience. Enable faster account setup—Administrators will soon be able to push Outlook mobile account setup configurations for modern authentication capable accounts. This will ensure that employees use the correct work account setup information to get them up and running with Outlook mobile in no time. When setup is as simple as entering a password, there are fewer calls to your helpdesk and securing your mobile workforce is fast and easy. This feature is already available for Exchange on-premises customers for accounts that use basic authentication. A new app configuration policy interface in Microsoft Intune—A new app configuration policy interface in the Intune console will initially support the ability to push account setup details for Exchange on-premises customers using basic authentication. In the coming months, we plan to continue to enhance the policy settings in this interface to manage the Outlook mobile feature settings, such as the ability to save or sync contacts and other app configuration capabilities. 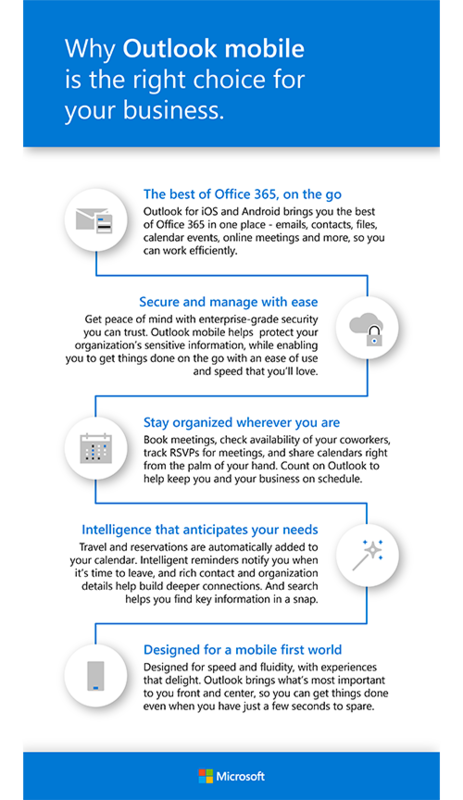 To help you accomplish more on the go, Outlook mobile will soon get new capabilities through Microsoft Teams and additional Office Lens integration, Favorite Notifications, and improved calendar experiences, so you can easily connect and organize to stay on top of what’s important. As customers continue to embrace Teams for collaboration, we are excited to integrate Teams meetings in Outlook. You will soon be able to add an online Teams Meeting option to your calendar events and join a Teams Meeting right from Outlook. Our goal is to introduce this capability to Outlook mobile early in 2019. Ever been to a conference and had to keep track of numerous business cards? In addition to using Office Lens intelligent technology for photos, documents, and whiteboard images in Outlook mobile, you will be able to simply snap a picture of the card, and the contact details will be automatically saved in Outlook. Customers also have the confidence that the images will be used in compliance with their company’s app protection policies and device camera settings will be respected. 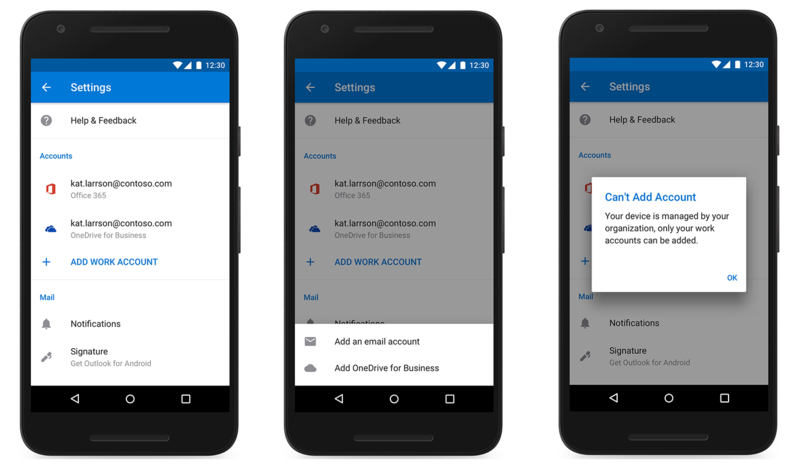 This feature will start rolling out to Outlook for Android customers in the coming months. There are some people in our lives whose communication should take priority, such as your boss, your significant other, or your kid, and you may want to respond to them in a timely manner. You will soon have the option set your notifications to “Favorites,” so you’re only notified when they send you an email or calendar event. Favorite Notifications are expected to start rolling out to Outlook mobile customers in the coming months. Improved calendar sharing—Today, we are making it easier to share schedules with coworkers and manage room reservations and delegated calendars. It’s as easy as adding a new calendar from the menu option in Outlook Calendar. Simply select Add Shared Calendars and search for people, rooms, or mailboxes. You will be able to add or view a coworker’s shared calendar or even a conference room that has a reservation calendar. We are rolling out this new Outlook mobile shared calendar experience to commercial customers now. Easily add a shared calendar for your coworkers or even a conference room, right from Outlook mobile. Search in calendar—And if you need to find a specific calendar event, we’re extending search in Outlook mobile beyond contacts, special reservations, deliveries, and files and will soon be adding search to calendar events. The Outlook mobile search experience is designed to help you find what you need even faster. This feature will start rolling out to Outlook mobile customers in the coming months. We are excited to bring these innovations to market. As we further our vision for Outlook mobile, we’re committed to listening and learning from you to bring you experiences that delight backed by the promise of enterprise capabilities. We hope to keep earning your trust and would love to hear your feedback and suggestions.